Resistors are passive devices used in electronic circuits to control the flow of current. An ideal resistor has no associated stray capacitance or inductance, and therefore performs exactly the same in a direct current (DC) circuit as it does in an alternating current (AC) circuit at any frequency. 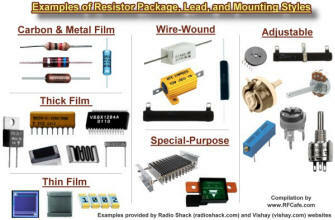 Real-world resistors made of physical components exhibit more than just a pure resistance when present in an AC circuit. A common circuit simulator model is shown to the left. It includes the actual ideal resistor with a parallel capacitive component representing inter-element (if present) mutual capacitance, and a series inductive component representing lead and/or solder/bond pads that respond to alternating current. SPICE-type simulators use this or an even more sophisticated model to facilitate more accurate calculations over a wide range of frequencies. Equations (formulas) for combining inductors in series and parallel are given below. Total resistance of parallel-connected resistors is equal to the reciprocal of the sum of the reciprocals of the individual resistances. Keep units constant. Total resistance of series-connected resistors is equal to the sum of the individual resistances. Keep units constant.